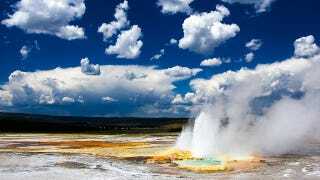 There's only a handful of known supervolcanoes capable of destruction on near-planetary levels - the one beneath Yellowstone National Park is the most famous - but even just a handful of such volcanoes have done plenty of damage. There's the Toba Event some 70,000 years ago, in which an Indonesian supervolcano affected climate patterns in Africa severely enough that humans almost went extinct. And then there's the Long Valley eruption that took place in California some 760,000 years ago. The eruption buried much of North America in thousands of cubic miles of ash and devastated countless ecosystems. The scale of the Long Valley eruption is unlike anything humanity has witnessed in it entire history, and the question Vanderbilt researcher Guilherme Gualda and his team set out to answer was just how much warning we could expect for the next Long Valley type eruption. Previous research has focused on the formation of zircon crystals inside the supervolcanoes. Using trace radioactive elements from these crystals, scientists had deduced that the initial formation of the magma pools and the resultant supervolcano eruptions were separated by some 200,000 years. If that's the case, then even the most rudimentary monitoring of these supervolcanoes would tell us whether humanity has anything to worry about from these volcanoes for the next several hundred centuries. But the Vanderbilt team's research focused instead on quartz crystals that started forming along with the magma pools and stopped developing once the eruption occurred. Our knowledge of quartz formation is well enough advanced for Dr. Gualda and his team to come up with a revised estimate for the time it takes supervolcanoes to form and erupt. If the quartz crystals are anything to go by, we're looking at just 500 to 3000 years between when the magma starts collecting and when the supervolcano has to blow. "Our study suggests that when these exceptionally large magma pools form they are ephemeral and cannot exist very long without erupting. The fact that the process of magma body formation occurs in historical time, instead of geological time, completely changes the nature of the problem." PLos ONE via BBC News. Image of Yellowstone geyser via *~Dawn~* on Flickr.